The Bermuda Football Coaches Association [BFCA] announced that registration for their UEFA Equivalent C License Course is now open, set to take place from March 4-10, 2019 [part 1] and September 9-15, 2019 [part 2]. 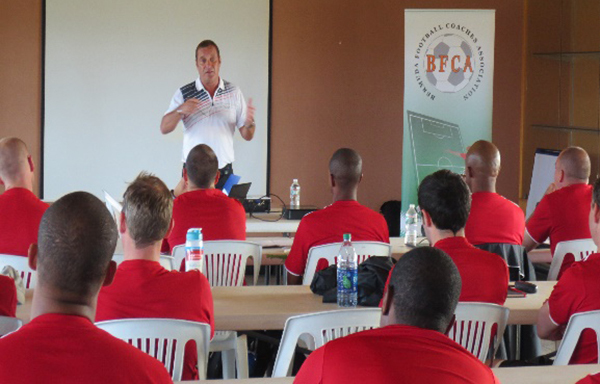 A spokesperson said, “The Bermuda Football Coaches Association [BFCA] is pleased to announce that registration for their 7th Annual UEFA Equivalent C License Course is now open. “This two part course is led by UEFA Instructor, Jacques Crevoisier, along with UEFA B License Coach Educators. It comprises classroom and on-field sessions, with individual assessments held at the end of the course. The course is sanctioned by the Bermuda Football Association [BFA]. “During the last six years 155 coaches have obtained their C License through the BFCA. “Jacques coached for the French Football Federation at Clairefontaine, winning the under 18 European Championship in 2000, and is a UEFA Senior Director for the Technical Department. “He was also the first team coach at Liverpool FC from 2001 to 2003, consulted for Sochaux, St. Etienne and Monaco and provided psychology work at Arsenal and Tottenham [he has a degree in sports psychology.] Jacques is a regular match day commentator on English Premier League and other top European games and a regular public speaker. “This 40 hour course teaches participants the main principles of coaching – organizing and effectively running group sessions, developing age specific training and analyzing training sessions and matches. The course was designed using UEFA Licensing standards to create a specific Bermuda certification. “Those participants achieving a score of 80 in their assessment will be considered as candidates to progress to the fully accredited UEFA B License, which is delivered by the Scottish FA. Each candidate for the C license course will receive the Coaching Handbook, three age specific coaching manuals. Who is the C License course for? “The course is suitable for coaches with two or more years of experience, or have attained the pre-requisite Intro to Coaching certificate. Candidates are encouraged to be in reasonable physical condition and to be prepared to participate in drills being run by their fellow coaches. “Candidates who successfully complete the course will meet the licensing requirements of the BFA, along with SCARS and First Aid / CPR training, and will be eligible to coach at the children’s and youth football levels up to U17. “Course fees may be split into two payments, with $250 payable prior to the start of part 1 [March], and the balance due prior to the start of part 2 [Sept]. Full payment can be made with registration. “Coaches who need to retest in order to improve their score for admission to the UEFA B course, must demonstrate they have been actively coaching for 12 months since they last completed testing for the C license. “Retest candidates must be current financial members and will be required to pay a retest fee of $100. No new materials will be issued to retest candidates and acceptance to a course will be subject to availability of space. Candidates wanting to retest should send an email to coacheducation@bfca.bm to apply. “You can register for the course by simply sending an email to coacheducation@bfca.bm . All the relevant registration materials and information will be sent to you in a reply email. The electronic form will allow you to fill in the required information and save and email it back to the BFCA to complete the process. Or print the form and handwrite in the information. “Registration forms are also available at the BFA office at the Clyde Best Center of Excellence in Prospect, and can be completed and dropped here for collection.